Dickens's A Christmas Carol, first edition (1843). 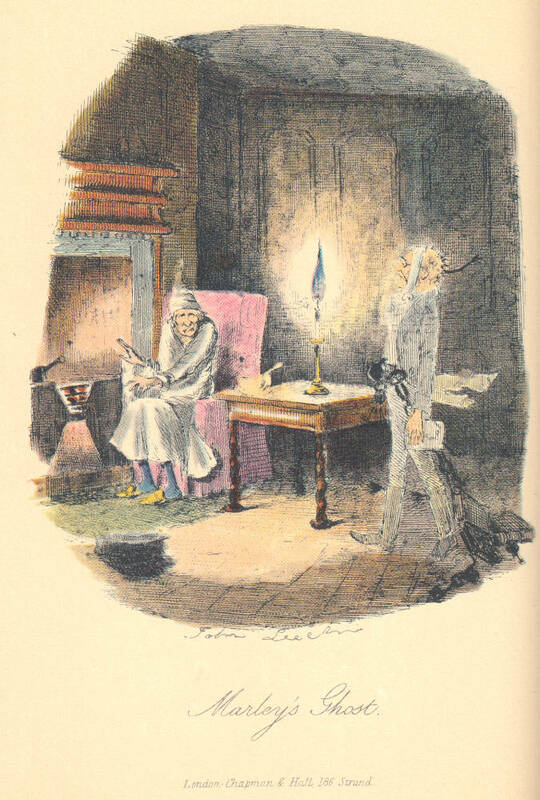 Leech's illustration captures the precise moment when the miser, in nightgown and sitting down before his fitful fire to enjoy a bowl of gruel, encounters the ghost of his dead partner. [You may use this image without prior permission for any scholarly or educational purpose as long as you (1) credit the person who scanned the image and (2) link your document to this URL.] Image courtesy of Toronto bibliophile and Dickens collector Dan Callinescu. Dickens, Charles. A Christmas Carol. London: Chapman and Hall, 1843. Facing p. 25 in "Stave One: Marley's Ghost."